St. Patrick’s Day is always the perfect excuse to learn more about Ireland. Certainly it’s fun any time of the year, but certainly St. Patrick’s Day always reminds me. 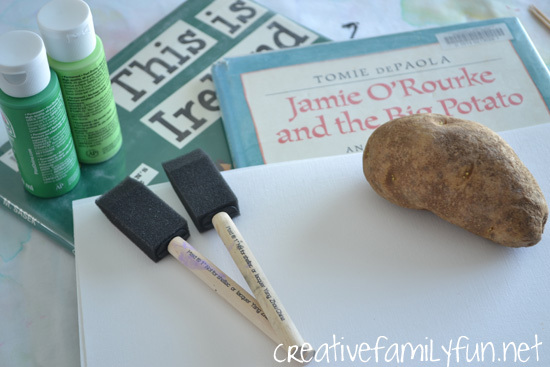 So, let’s go to Ireland, learn a little about Irish folklore, and create a fun shamrock potato prints printmaking project. When researching our Irish project, I found a wide selection of Irish folktales and soon settled on Jamie O’Rourke and the Big Potato by Tomie DePaola. We love Tomie DePaola books and knew he would tell us a fun tale. After enjoying the story of Jamie O’Rourke, the laziest man in all of Ireland, we decided not to be lazy and to start crafting. 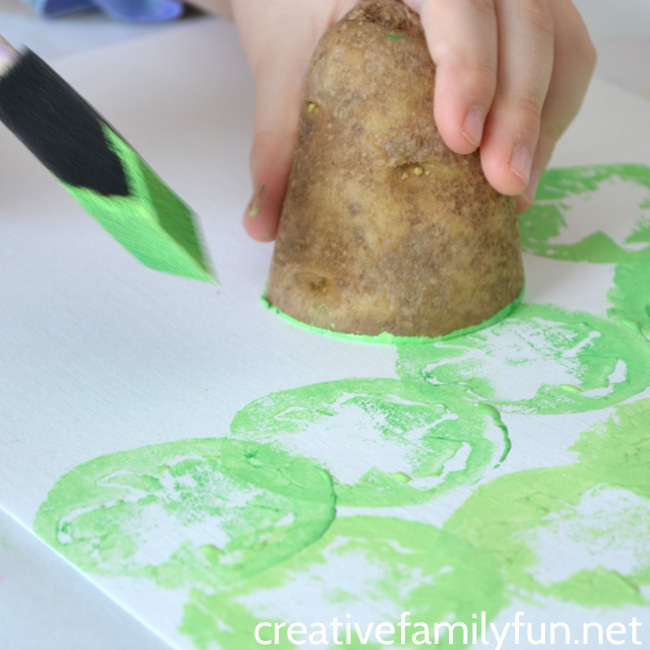 Since the book centered around a potato, we decided to try out potato stamping. The grown-up in charge will have to prep this project. 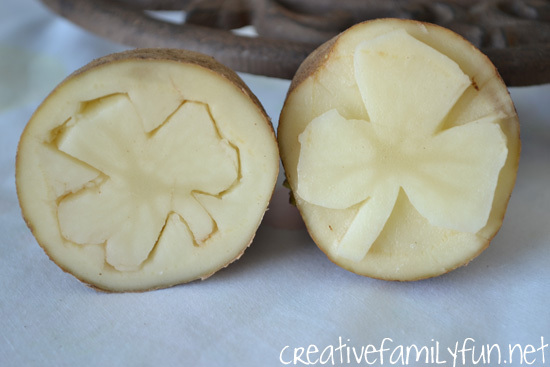 To make the potato stamps, cut a potato in half. I used a toothpick to “draw” my shamrocks before cutting. 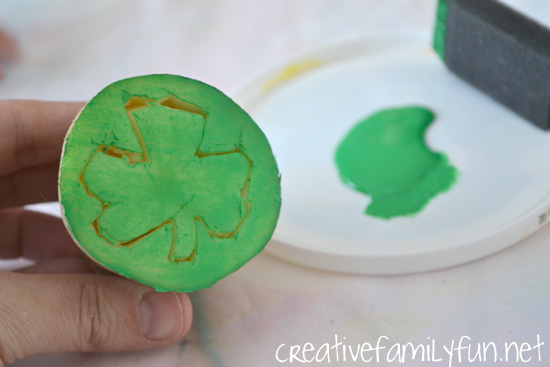 Then using the knife I cut around the shamrock to make my stamp. We made two different styles of stamps. On one, I cut out the shamrock and on the other, I cut a thick outline of the shamrock. We used the paintbrush to paint some green paint onto our stamp. I used a couple of different shades of green since we were using shamrocks. The girls painted and stamped and painted and stamped some more. We weren’t so worried about the end product. This project was all about the process. The girls enjoyed stamping and seeing the texture from the potatoes. After they covered their paper, they got creative. 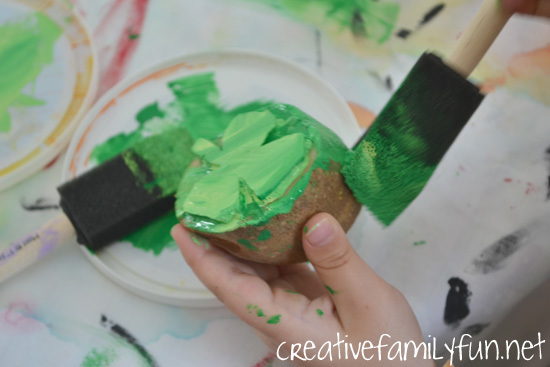 Soon our potatoes were completely painted green! So much fun! 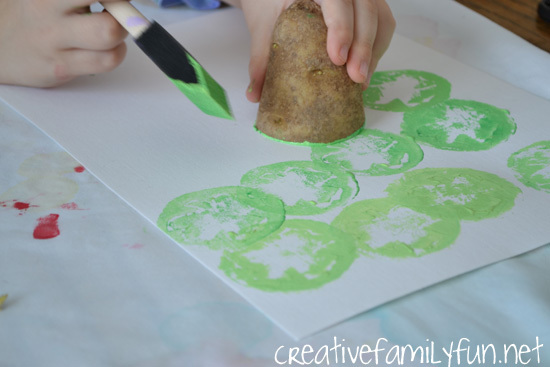 You can keep these shamrock potato prints as a fun process art activity or you can use your potato stamp to decorate note cards, notebook covers, wrapping paper, or a fun wall hanging. If you would like to try an Irish recipe to go along with your art project, check out this yummy Soda Bread Recipe from Glittering Muffins. You can download a printable passport page here and a placemat here to help you learn all about Ireland as part of the Around the World in 12 Dishes blog series. Previously posts March 18, 2013. Updated and republished 2018. 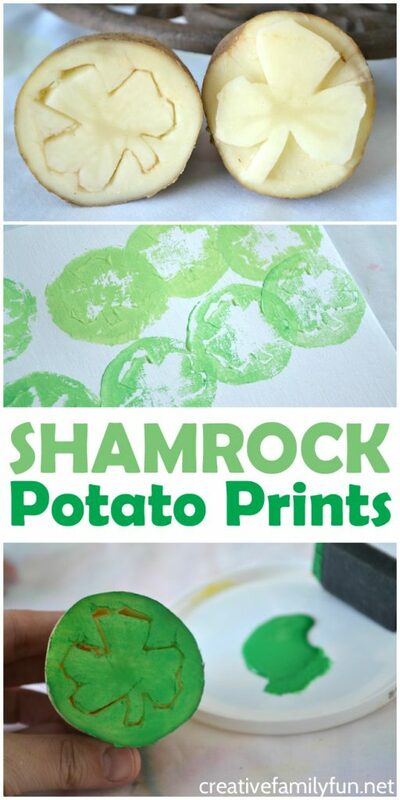 If you enjoyed these shamrock potato prints, the above photo is perfect for sharing on Facebook or you can save the photo below on Pinterest.